Prayer has to be the most important activity that we as Christians participate. It’s how we connect Heaven to Earth. On May 4th here in the U.S., we will observe a national day of prayer. What if we could get every Christian on the planet to observe a day of prayer? Praying is just what we do! 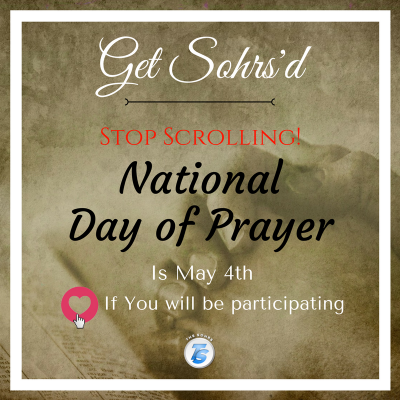 This week’s Get Sohrs’d focus is share our social media posts (on Facebook, Twitter & Google+) or a post of your own if you will be participating in the National Day (5/4) of prayer. It’s time you showed your world what Christians do best!